Whilst working on the conservation of the chest tombs in the churchyard of St James West Littleton, a number of “walled graves” were discovered. Gwynne Stock from Tormarton has researched and published [see references] details of a number of post medieval burial sites, both Anglican and Quaker; to gain some understanding of practices. His 1997 measured plan of St James Church and Churchyard [this website’s map] was used in the original application to HLF for funding support for the Conservation Plan. He has kindly agreed to the presentation of some of the interesting details here on the stjamesmonuments.org website including the diagram below which appears on page 136 of the referenced publication. The West Littleton walled graves conform to the general pattern outlined in the papers. They are constructed of local stone in this instance although brick construction is more often found in graves of this period (1650 to 1850). The Bath stone (ashlar) blocks used for the walls are about 120mm thick. The graves seen on this site are all coffin shaped with the side panels set into recesses in the end panels to lock them in place against pressure from the soil. The shape not only minimises the soil to be removed when building the grave but, more importantly, gives great strength and rigidity of the structure against compression by the soil. 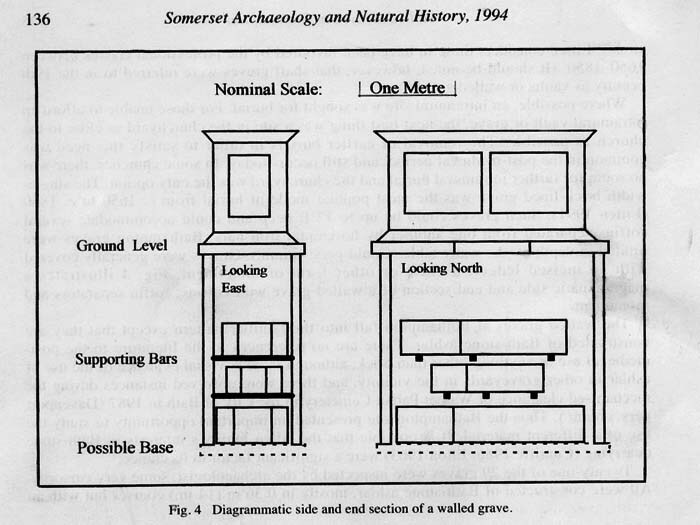 Two of the walled graves found were beside chest tombs but one was directly beneath a chest tomb and it is thought to conform to the features as shown in the diagram. The depth of the graves could be anything up to about 3 metres and in such cases would have been used to hold several members of the same family. One of the West Littleton walled graves was measured at 1.09 metres deep to a stone layer which sounded hollow when tapped. It is probable that this grave is much deeper and has an intermediate thinner stone capping. The stonework in the upper part of the grave was clean and undamaged. Clearly this part had not ever been used. The other visible parts of the West Littleton walled graves were filled with earth and rubble and were not investigated further but it is thought that those interred in them would have been in lead-lined sealed coffins, perhaps supported on iron bars as shown in the diagram, with no earth or other filling around them at that time. The top capping stones of the graves where not under chest tombs are roughly hewn and about 130mm thick and are located just below the present ground level. Chests themselves were always empty and were in effect merely monuments to demonstrate the wealth and importance of those in the walled graves below them. The walled graves seen in West Littleton to the south of the church path are mainly aligned with that path and as a consequence are not quite lying in the more usual "liturgical" east/west orientation. The chest tombs nearer to the church building tend to align with the church. It was perhaps more important for some that the monuments should be clearly visible to those entering the church up the church path with the most important being near the church door than it was to lie east/west!